Daniels Waterfront Condos: Lighthouse Tower Condos is a new preconstruction condo development by The Daniels Corporation located at 132 Queens Quay East in Toronto (Queens Quay/Lower Jarvis). 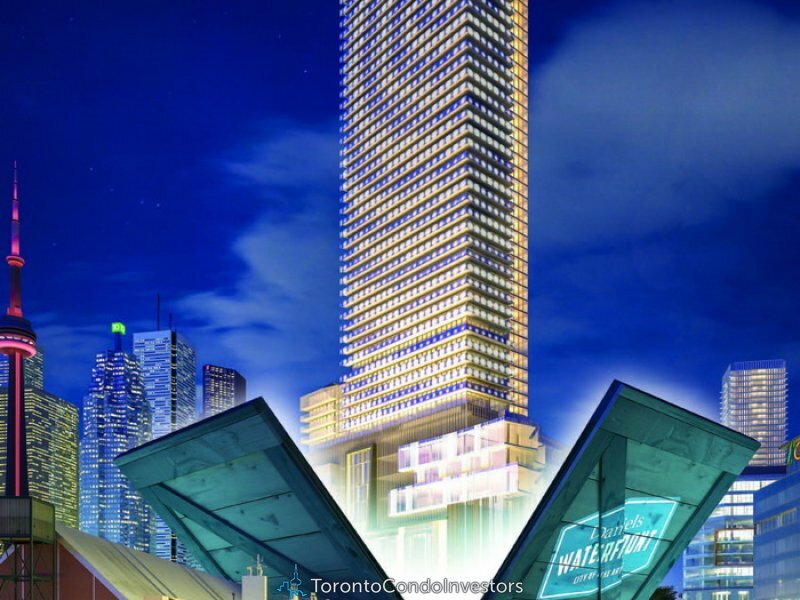 Daniels Waterfront Condos: Lighthouse Tower Condos will be 45 storeys with a total of 534 condo units. Estimated completion date is set for Summer 2019. There will be 1.32 Million square feet of retail, office, residential and cultural space in this master planned community. Amenities at Daniels Waterfront Condos will include 9th floor outdoor amenities including a recreational zone, featuring a full-size tennis court and community gardening pots. 9th floor indoor amenities will include a fitness centre, art studio, music studio, home theatre and gardening prep studio. The 11th floor will offer a billiards studio and sports lounge. There will also be outdoor amenities on the 14th floor including an entertainment zone featuring a landscaped terrace with lounging areas cocktail pool and BBQ area. 14th floor indoor amenities will include a catering kitchen, private dining room, lounge and party room. SIGN UP TO RECEIVE EMAIL UPDATES ON NEW PRE-CONSTRUCTION ANNOUNCEMENTS, SPECIAL PROMOTIONS, SALES & MORE. Copyright © 2019, All Rights Reserved. The information provided is for reference purposes only and is without any representations and warranties.